If I’ve been bellyaching about being occasionally housebound by the recent snows, as least I have an ample supply of beer on hand. Pity the poor regulars of The Locks Inn at Geldeston in Norfolk, England. Due to the recent rains and subsequent flooding the local has been closed, cutting off their access to the Green Jack taps. No airlifts or drone deliveries are contemplated. The Locks is one of three pubs owned by the Green Jack Brewery. Tim Dunford took ownership of the first, The Triangle Tavern in Lowestoft, Suffolk, in 1996, and began brewing there in 2003, making it the easterly most brewery in the U.K. A production brewery succeeded it in 2009, and it is there that Green Jack is producing about 5,000 barrels a year of real ales, 90% of it in kegs and some in swing-top bottles. Most is sold locally, but happily some is imported here by Vanberg & DeWulf, and the company was kind enough to send me one 25.4-oz. bottle. Celtic folklore is packed with similar pagan deities, alternatively named the Green Man, Jack in the Green, or Green George. 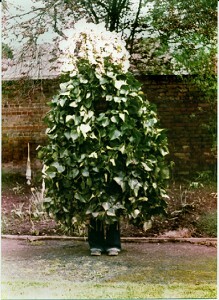 In present May Day celebrations those dressed as the Green Man are virtually enveloped in tree foliage. In the case of the brewery logo, a more mischievous-looking forest sprite is depicted, dancing about as though he’d already downed a pint or two. He’d have a large choice from the Green Jack roster, many of them session beers, or relatively low in alcohol by current U.S. standards. Those that Vanburg & DeWulf are carrying include Trawlerboys Best Bitter (4.6% ABV), Lurcher Stout (4.8%), Red Herring Smoked Ale (5%), Fruit Bat Fruity Ale (5.5%) and Gone Fishing E.S.B. (5.5%). 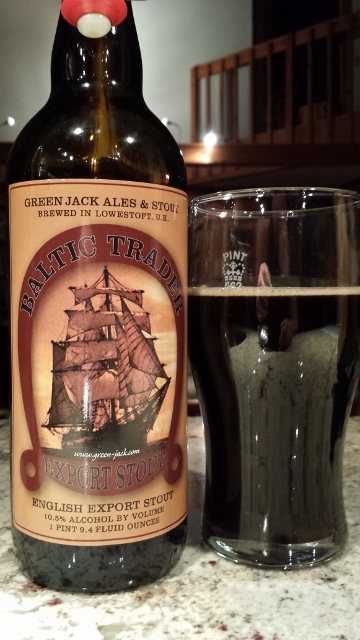 The two strongest beers in the Green Jack portfolio are also available: Rippa, an 8.5% Barley Wine (called Ripper in England), and the Baltic Trader, which clocks in at 10.5%. 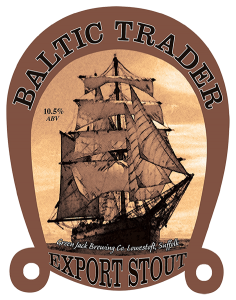 The brewery calls it an Export Stout, the name suggests a Baltic Porter, the alcohol level pegs it as an Imperial Stout. Whatever. 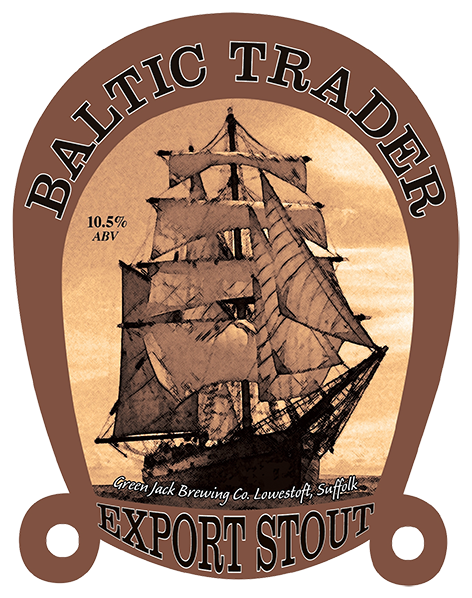 The brewery says the beer is named for the Baltic Trader sailing vessels that plied their trade on the North Sea, one of which is shown in full sail on the label. The trade was often for those silver darlings of the sea—herring. In the full flush of autumn herring runs the Lowestoft port was said to be so packed with trawlers that workers could traverse the harbor simply by stepping from one deck to another. Fitting that the Green Jack brewery is housed in a former herring smokehouse, and hardly a surprise that I detected a woody, almost briny finish to the beer. But it’s a hearty voyage from the get-go. There’s a high octane bitter chocolate aroma, revealing sweet flavors of dark fruits—raisins, dates, figs–with a touch of licorice swimming in the inky depths. There’s a full and coating mouthfeel, a moderate alcohol burn and ample hopping leading into that tannic bite. It will put some wind in your sails.